Evacuated tube collectors are the Formula One of the solar thermal world. They are more efficient than other types of collector as they are almost perfectly insulated, and heat cannot pass through a vacuum. As the tubes are cylindrical, they are always perpendicular to the sun reducing the amount of energy that is reflected before it hits the absorber. They are capable of achieving much higher temperatures than other solar collectors as the vacuum ensures that no heat is ever lost. Some evacuated tubes get as hot as 298˚C while the outside of the tube is still cool to touch. The vacuum in the evacuated tubes also has the advantage of allowing the tubes to function regardless of how hot or cold it is outside. They will start working as soon as there is radiation. This means that even on a freezing cold winter’s day as long as there is sunlight, your solar system will still be providing you with energy. 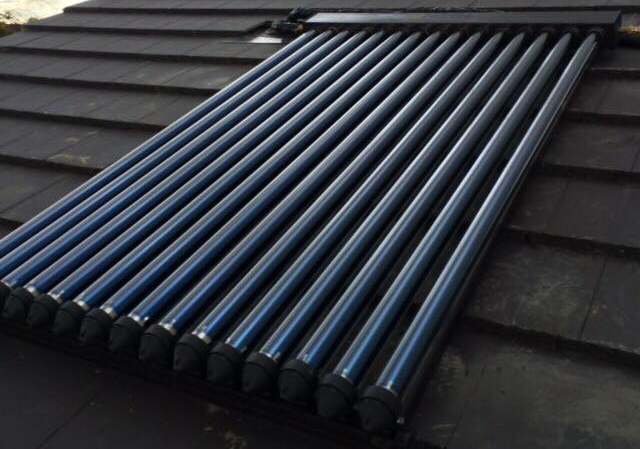 Evacuated tubes do not rely on direct sunlight in the way that photovoltaic panels do. They will still work in low light conditions.